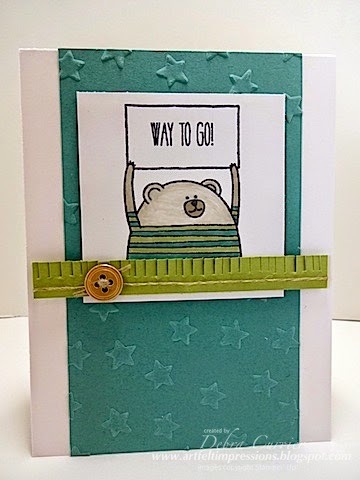 For my first project I used the Cheerful Critters stamp set. I just think these little guys are the cutest! And you can put any small sentiment inside the signs! I love it! I thought that this little guy would be great for a young boy's birthday or achievement! I used the Sweet Sunday Sketch to help me with the layout. For my next card I went a little more sophisticated. I love sunflowers. So I wanted to try to recreate a sunflower since I don't have any sunflower stamps. 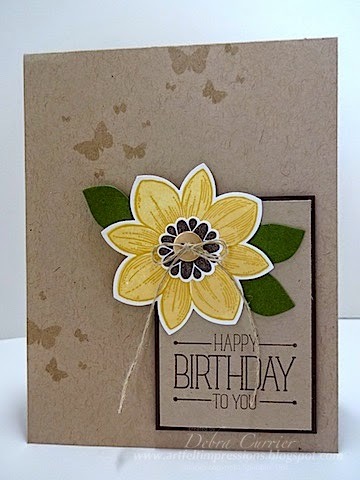 I found an idea where someone had layered the stamps from the Petal Potpourri stamp set and a light bulb went off (trust me, it doesn't happen often - lol)! I love how this turned out! I hope you have gained some inspiration! I now send you on to the fabulous Wendy Weixler to see her beautiful creations! Thank you so much for stopping by and have a super day! Cute cards! I really love the second one and may need to get that calendar set! I was just looking for lil butterflies today and didn't have any. These would have been perfect for my card.